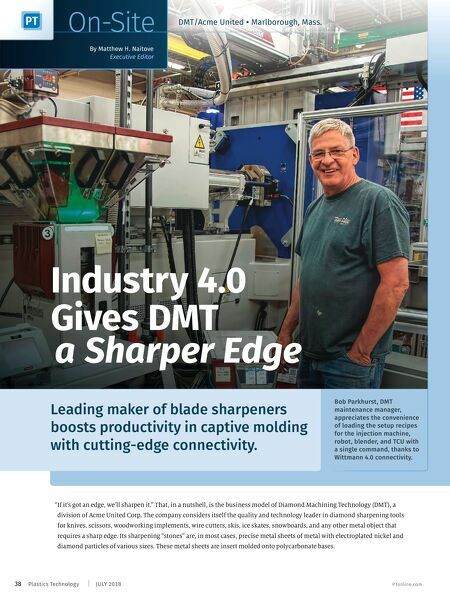 Leading maker of blade sharpeners boosts productivity in captive molding with cutting-edge connectivity. "If it's got an edge, we'll sharpen it." That, in a nutshell, is the business model of Diamond Machining Technology (DMT), a division of Acme United Corp. The company considers itself the quality and technology leader in diamond sharpening tools for knives, scissors, woodworking implements, wire cutters, skis, ice skates, snowboards, and any other metal object that requires a sharp edge. Its sharpening "stones" are, in most cases, precise metal sheets of metal with electroplated nickel and diamond particles of various sizes. These metal sheets are insert molded onto polycarbonate bases. Industry 4.0 Gives DMT a Sharper Edge Bob Parkhurst, DMT maintenance manager, appreciates the convenience of loading the setup recipes for the injection machine, robot, blender, and TCU with a single command, thanks to Wittmann 4.0 connectivity. 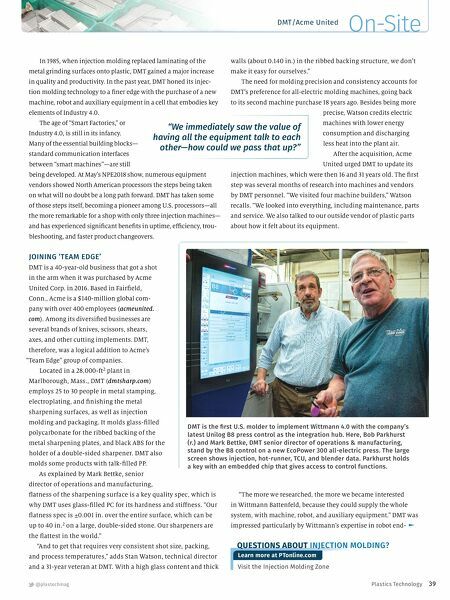 38 JULY 2018 Plastics Technology PTonline.com By Matthew H. Naitove Executive Editor On-Site DMT/Acme United • Marlborough, Mass.